Arif and Shajib had not met any freedom fighters before. Students of Class V in a school in Badda, the closest they have come to know about the country's Liberation War have been through text books and story books, which gives account of "The seven Bir Sreshthas, their heroic deeds and a few other exciting stories of struggle against the Pakistani armed forces, the martyred intellectuals." But interacting with and listening to their stories first hand was indeed a novel experience. So, when the two young boys started recounting this memorable meeting they were beside themselves with excitement. "I felt that I could also have fought so courageously if I had been there at the time of the Liberation War!" said an inspired Shajib. 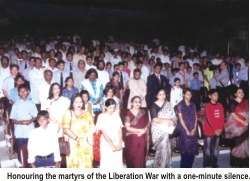 Moments earlier, the two along with more than a hundred others had ushered the heroes of our Liberation War into the BIAM auditorium, each holding the hands of the freedom fighters. The occasion was a unique congregation of the urban guerrilla fighters and the young generation. Organised by Spectra Group, the event featured some 150 members of the different guerrilla platoons that had operated in Dhaka during the nine-month-long war and taken in many remarkable missions in Dhaka city and its adjacent areas during the Liberation War. The war heroes shared some of their unforgettable memories with about 300 students from six schools of the capital. The reminiscences of the freedom fighters were punctuated by cultural performances by the artistes of the Swadhin Bangla Betar Kendro (SBBK) and young performers of Tona Tuni. Especially dance pieces with the songs “Shei rail liner dharey" and “Amar shonar chand Altaf" brought tears to one's eyes. 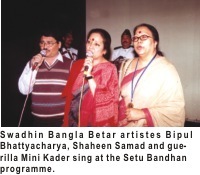 Swapan Dutta, Mini Kader and Shahin Samad of SBBK performed patriotic songs that drew huge inspiration for the freedom fighters. A few video clips also helped the young audience realise the horror of the brutality carried out by the Pakistani military especially on the night of March 26 night and December 14--the our intellectuals were picked up from their houses to be brutally killed. Later their bodies were dumped on the outskirts of the city. "A few months into the Liberation War, many places across the country were gradually liberated from the grips of the occupation forces. But Dhaka remained a stronghold of enemies," said Ishtiaq Aziz Ulfat, a member of the famous 'Crack Platoon' that carried out a couple of blasts on the then Hotel Intercontinental. 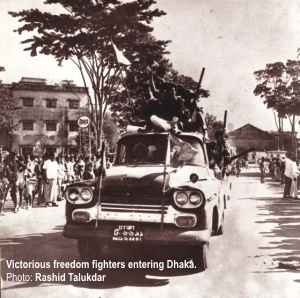 "Many of us, who were all spirited youths, felt that independence was impossible unless Dhaka was liberated. So, we decided to execute our war inside this city," he added. However, it was not an easy task for anyone from the resistance at that time to move about the city with weapons and ammunition. "Moreover, the Pakistani military and the Razakars (collaborators) always kept eyes on the young boys--they would pick up anyone if they sensed any suspicious movements," explains Ulfat. "So, we had to work very cautiously--most often under cover, and we used to frequently change our shelters to avoid arrest of our selves as well as harassment of those who provided us shelter." 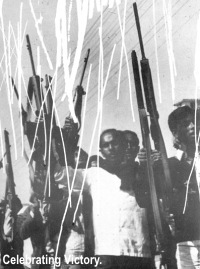 Initially, about 30 guerrillas started operating in Dhaka, but the number soon rose to about 300. These guerrillas worked in 30-40 groups known by the names of their leaders, informed Ulfat. "Brave leaders like Shajib, Aziz, Liakat, Baki, Nazmul, Manik, Erfan, Tipu, Nazmul and Asad successfully led their own groups. And, of course, there was our Crack Platoon," proudly said Ulfat. Freedom Fighter Shahidullah Khan Badal threw light upon the life at the training camps. "There were no such formal camps actually. The young boys, who had come to join the Liberation War, themselves built the camps. One such camp was named Mela Ghar," Badal recalled. There was not much supply of food, water and medication. The trainee freedom fighters used to dig wells for the water supply. How many days would one training-course last? 'Hardly 15 days', informed Badal. And this naturally astonished young Touhid, another schoolboy: "It is amazing that all those youths fought so courageously and successfully with so little training!" he said. 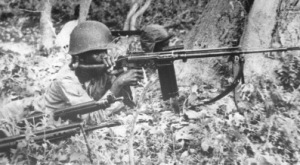 And within that short period the freedom fighters had to learn how to operate weapons like SMG and SLR, how to charge grenades and prepare a bomb, how to swim across rivers without getting the weapons wet and many other aspects of a guerrilla warfare. 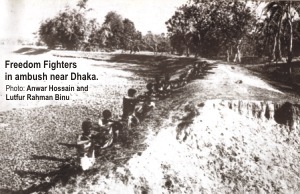 Ali Ahsan Sohel went to the war with some of his friends. "I knew that it cost about Taka 250 to reach the training camps from Dhaka. I also knew that my father used to hide some money for emergencies inside a ventilator of our house. So, one day I stole all the money and set off with my friends for the borders," Sohel reminisced. "Later I realised that the amount was not less than 10,000 taka, but my father never asked me anything about the money!" At the training camp Captain Haider formed the Young Platoon--Y Platoon, in short--with these boys. Returning from the training, Sohel's group set up their camp at Savar under the leadership of Manik. Later, Manik was martyred during an operation on the Dhaka-Aricha highway and the charge was given to now-renowned theatre personality Nasiruddin Yousuff Bachchu. Taufiqur Rahman was one of those brave guerrillas who planned to destroy the petrol pump at Kakrail. While planning the details of the operation, the group noted the post-operation escape as the hardest part of the mission. "It was the month of Ramadan then, so we decided to operate just before iftar when the whole city would be busy in the ritual," said Rahman. "Our timing was never better in any other missions," he added. Just at the time of iftar the whole city jolted with the tremendous sound of the blast. "One of my friends named Nehal helped us escape from the scene in his car," Rahman gratefully recalled. 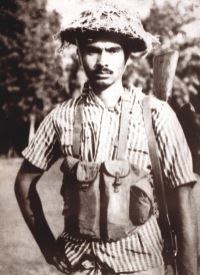 Gazi Golam Dostagir was one of those brave guerrillas who planned to destroy the five power stations in Dhaka. But, why destroy the important establishments of a country which the freedom fighters were struggling to liberate, the innocent minds of the young boys and girls must have questioned. "We reckoned that blowing up the power stations would create real terror amongst the Pakistani military. Moreover, such a massive operation would help us alert the international bodies that had been kept in the dark with false information about the war by the Pakistani rulers," explained Rahman. So, according to the plan, at 8:30 one night all five power stations were blown away simultaneously. However, no other operations could perhaps make the western world realise the gravity of the situation better than the bombing of the Hotel Intercontinental. For, the hotel was always under heavy security as many foreigners including a delegation of the World Bank and the Chairman of the consortium that helped Pakistan were staying at the hotel at that time. Freedom fighter Abdus Samad had a small business of neon signs and glow signs. The office of Pakistan International Airlines was being shifted from its position to the east corner of the hotel arcade. Samad took the opportunity and managed the contract of fitting neon signs of the new office. This facilitated him with free entrance to the hotel and observing to keep constant vigil, which was crucial for a bombing operation. The group--also comprising Baker, Ulfat, Gazi and Dulal--decided to set up the bomb in the men's toilet just opposite the Saki Bar. The blast was so powerful that the lounge and the arcade of the hotel and its adjacent rooms were almost completely destroyed. Zillur Rahman Dulal took a lot of photographs of the mission despite the high risk of getting caught. Unfortunately, these photographs have been lost. A World Bank representative later informed the international concerns that "We found that no more peace prevails in East Pakistan and it shows guerrillas can move in Dhaka at their will." 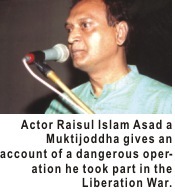 Actor Raisul Islam Asad's mission was one of the most heart stopping one. "We had to execute our plans twice: on the first occasion, the bomb did not go off due to a wet fuse," Asad narrated. "About ten pounds of explosives were set up inside a car parked near the Baitul Mukarram Mosque market. But I was very desperate about not wasting the explosives--ten pounds of which was so invaluable to us at that time. So, we executed our plan again in the afternoon and this time with absolute success," Asad said. Nasima of Class VII felt that women's contribution in the Liberation War has not been evaluated properly. "I have always heard about how inhumanly our women were tortured by the Pakistani military and the Razakars. But nobody has ever told me that we also had brave warriors like Mini Kader," she complained. "The stories of Mini Kader helping our freedom fighters by hiding caches of arms and ammunition or accompanying them while going on a mission are very thrilling and inspiring." Not only the stories of heroic missions, that of Masud Sadek Chullu's being tortured by the Pakistani military also touched the young souls. "I cannot imagine how painful it would be to insert a needle through one's fingers but I know that would be beyond endurance," said an apparently shocked Limon, a boy of Class IV. The heroic operations by these brave young men and women helped the Liberation War progress towards its victorious end. "But none of these important operations would have been possible if there had not been the help of freedom fighter Abdus Samad," commented Ulfat. "He (Samad) maintained the coordination among different groups of the freedom fighters. He would also help us in planning the missions," he added. However, after the Hotel Intercon mission, the coordination in Dhaka collapsed and a number of freedom fighters were arrested by the Pakistani army. 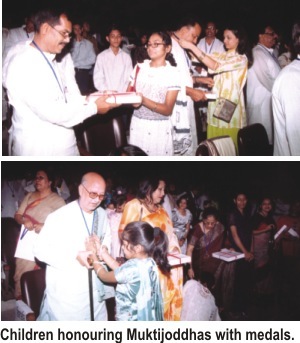 Among them were the fathers of Ulfat and Kamrul Haque Swapan, Azad, Chullu, Rumi, Abdus Samad, Altaf Mahmud and others. "Only Samad and Chullu came back--the rest were martyred," said a solemn Ulfat. 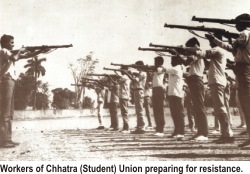 The reminiscences of these guerrilla freedom fighters throw light upon different phases and aspects of the Liberation War: days at the training camps, the risky guerrilla operations in Dhaka and their significance, torture by the Pakistani army and their Razakar accomplices, contribution of general people by providing shelter to the freedom fighters or hiding arms for them, risking their own lives. Legend has it that Sector I started the war and the urban guerrilla fighters of Sector II kept the war alive. These guerrillas also included day-labourers, rickshaw-pullers, motor-mechanic, bus-drivers and many other ordinary people who continue to remain unrecognised. Shetu Bandhan certainly could not gather all the fighters but it was surely the first event to acknowledge the contributions of these unsung heroes of our Liberation War. It was also a unique occasion to bring members of the younger generation face to face with real life heroes.